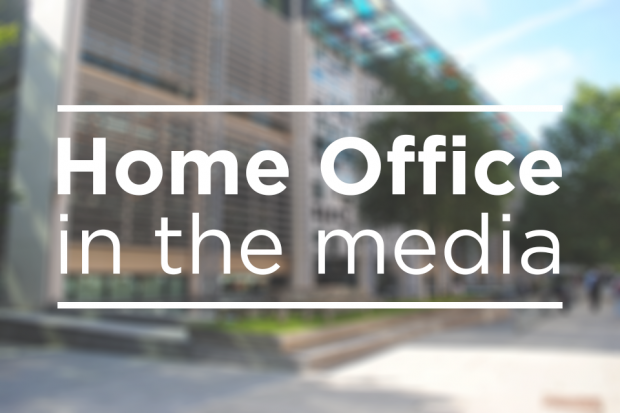 Today’s Home Office in the Media stories include immigration detention, medicinal cannabis and foreign student migration. The Times, Guardian, Independent and Metro report that the Home Office agreed to pay £50,000 in compensation after a three-year-old girl was placed in care while her father was unlawfully in immigration detention. The man who had been serving a 20 months prison sentence was transferred to the Verne Immigration Removal Centre. According to the articles, the Home Office admitted at the High Court that the detention of the father was unlawful as it breached both the department's policies and the father and daughter's right to family life. We try to keep families together wherever possible and when considering returns put the need to safeguard and promote the welfare of children at the centre of any decision. In this case we accept that we did not comply with our own published policies. The Today programme, Sun, Guardian, Times, Independent, Mail, Mirror, Metro and Standard report on the case of seven-year-old Sophia Gibson, who is currently waiting for cannabis oil, and is now in intensive care. The papers report that Sophia from Northern Ireland is waiting to hear if she will be granted a licence to be treated with medicinal cannabis oil, but has been admitted to hospital after a severe seizure. The papers say her parents, Danielle and Darren Gibson, have yet to hear a response from the Home Office. In Northern Ireland licensing decisions are devolved and any recommendations on licence applications made by the expert panel would be considered by the Department of Health Northern Ireland. According to the Daily Mail the number of foreign students applying to British universities has hit a record high - despite warnings about the impact of Brexit. The article notes that official university application figures show 125,510 EU and overseas candidates have applied to take up degree places this autumn. We welcome international students and recognise their contribution to the UK's world-leading education sector, both culturally and economically. There is no limit to the number of genuine international students who can come here to study. University sponsored Tier 4 visa applications increased by 6% in 2017 and are now 24% higher than they were in 2010. The grant rate for Tier 4 (general) applications has also risen every year since 2010 and in 2017, 97% of such applications were granted.